The doctor did not even introduce herself to me and i was asked to step out the room so someone elsecan be seen and also there was no privacy people keep entering the office. The doctor did not even introduce herself to me and i was asked to step out the room so someone else can be seen and also there was no privacy peoplekeep entering the office. Outstanding!!!!! Highly recommended. I'm so thankful I saw her. This doctor is a real genuine caring person. 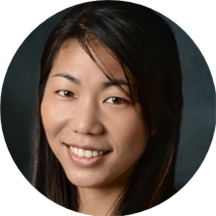 Eunice Kohara, D.O., is a board certified pediatric ophthalmologist and strabismus surgeon. She specializes in the medical and surgical treatment of pediatric and adult strabismus, as well as the treatment of all childhood eye conditions. Dr. Kohara graduated from University of California, Santa Barbara and received her medical degree from Touro University California, College of Osteopathic Medicine. She then completed her ophthalmology residency at St. John’s Espiscopal Hospital/ Interfaith Medical Center, where she served as chief resident, and went on to complete her fellowship in pediatric ophthalmology and strabismus at Wills Eye Hospital. Dr. Kohara loves taking care of her patient and their families. She treats many children with special needs, including Autism, Down Syndrome, genetic disorders, and other syndromes. Her goals are to help each child develop healthy eyes and achieve their best possible vision. She is skilled in the treatment of a wide variety of eye disorders, including refractive errors that require glasses, eye muscle disorders, amblyopia, cataracts, tear duct disorders and eyelid disorders. She is fellowship-trained to perform a wide variety of pediatric ophthalmic surgeries, including pediatric and adult strabismus surgery, cataract surgery, tear duct surgery, and oculoplastic surgery. Dr. Kohara also treats adults with eye muscle disorders and double vision stemming from a wide variety of causes, including thyroid disorders, cranial nerve disorders, tumors, and long-standing strabismus. She utilizes both medical and surgical treatment to achieve the best possible results for her patients in accordance with their goals. Dr Kohara tries to understand further the symptoms you have. She is very interesting to talk with and very detailed oriented. Great experience, thorough doctor and kind and informed staff. Would highly recommend. She is kind, patient & she takes her time. She was very thorough and she explained everything in layman's terms. Her staff was very polite and very helpful as well. Dr. Kohara was very helpful and explained everything concisely and calmly. Dr. Eunice Kohara, DO is very knowledgeable, thorough and highly professional. The only issue is the appts. are very long and I observed several people leave because they grew tired waiting. Disappointed! After an almost 3 hours wait time before the doctor saw my kid - we only had less than 10 minutes with the doctor and we got dismissed because my kid was crying and she decided to not proceed. Howon earth my kid won't b crying when the doctor slipped in an eye drop unannounced to my kids'eye??!! As a pediatrician or kids eye doctor, one would think the doctor would have at least some skills to make it comfortable for the child or at least make the child at ease before slipping in something to sensitive eyes (esp for first time patient). Instead the doctor just stared and waited until my crying child stops -- unbelievable! Did not even advise us parents on what we can do to help the treatment. The doctor was non-engaging. Basically, leaving that office made me feel she's disinterested, just waiting for the appointment to be over. People skills/child skills are just way less than par. I would give zero, if I can, but because there's the receptionist and one assistant that saves this place - only those were at least nice and representing "pediatric/friendly environment". At least the first assistant who tested my kid with ABCs and try on different glasses made that test worthwhile- she was amazing! This assistant made the test fun that avoided a crying session with a first time child patient. This assistant is way highly commendable and has proper child skills than the doctor herself, unfortunately. I will not come back and definitely will not recommend this doctor to any parent. I went to the clinic to get help, rather I found one that made the visit disservice. No parent should ever feel that a scheduled appointment is being rushed/time consumed just to get it over with. Her professionalism for someone who has a known and advocates fear of eye doctors was minimal. She made it highly uncomfortable for me and charged me an insane amount of money for a service she promised was covered by my insuranceand charged me for services I requested to NOT be done. This office was a scam and highly unprofessional! Would never recommend! She was wonderful, kind, thorough. She made me feel at ease and she helped me with my issue. Thank you I highly recommend Dr Kohara!